Our condo is right across from the Metropolis at Metrotown mall, simply “Metrotown” to the Vancouverites. Wikipedia tells me that Metrotown is the largest mall in British Columbia and the second largest mall in Canada. What I don’t need Wikipedia to tell me is that the mall is a zoo around this time of the year. This zoo has all kinds of animals. The Cheetahs who move from one store to the next at dizzying pace, the cute looking Chihuahuas who defend their territory with all their might and the sly jungle cats who will steal your cart – with your stuff in it. Anup and I, we feel like lost puppies when we visit the mall around this time of the year. Remembering each individual that you hold near and dear to your heart, and buying something special for them around the holidays is a beautiful thought. When thousands of people have this same thought with only one weekend to spare before the holidays, there is chaos. I know because Anup and I braved the Vancouver cold to walk to the Metrotown last night. Not only did we return home empty handed, we both were so tired we slept like babies all night! I remember my parents discussing months in advance what “gift” would buy for each other on their birthdays. There was no element of surprise and the gifts were generally things they needed to buy anyway – a blender, a saree, a shirt and so on. May be it was the way we were raised, but Anup and I were never really into giving gifts to each other either. Mr. Practical always found a better way to spend the 20 rupees he would have spent on buying me flowers. It was a bit of an adjustment for me initially, but I have since enjoyed this “not giving” a gift. Since gifts are mostly missing in the equation, our special occasions generally revolve around food! Whether we dine out or cook a meal together at home, food plays a big part in us creating memories together. For the holidays, I have made homemade truffles to capture the spirit of the season, without the bad calories that will haunt me when the holidays have come and gone! 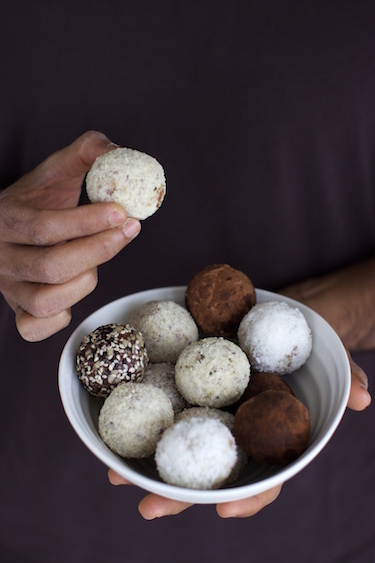 These truffles are simple to make and only use four basic ingredients – almond flour, coconut flakes, dates and coconut oil. 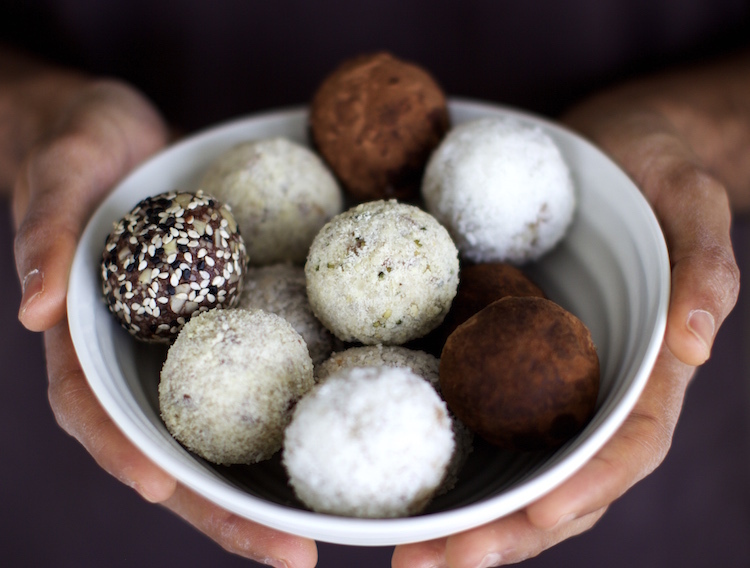 You can make these truffles your own by using your own choice of coating. You can be adventurous with your coatings – from seeds, nuts, coffee, cocoa to even spices like cinnamon, cardamom, ginger powder etc. 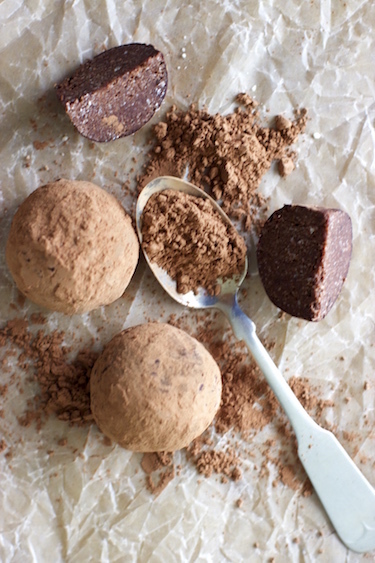 These truffles get their sweetness from dates and have no other added sugar. They are also full of omega-3 fats from the nuts and coconut. 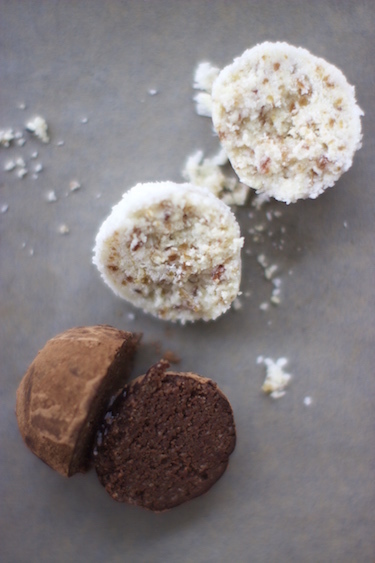 These vegan and gluten free truffles will keep you energized during your shopping sprees at the mall. Happy Holidays! *to make chocolate truffle, add 3 tbsp cocoa powder to the recipe. *suggested coatings: cocoa powder, coconut flakes, sesame seeds, hemp seeds, quinoa/oat flakes, chopped nuts. Put dates and coconut oil in the food processor and pulse until it turns to a chunky paste. Now add all other ingredients and pulse until it forms a crumbly ball. Feel the mixture between your fingers to see if it’s sticky enough to form a ball. If it’s too crumbly add some coconut oil, if it’s too wet, add some coconut flakes. Refrigerate the mixture in a bowl for 10 minutes. Now take 1 to 2 tbsp of mixture between your palms and form a ball. Repeat for remaining mixture. 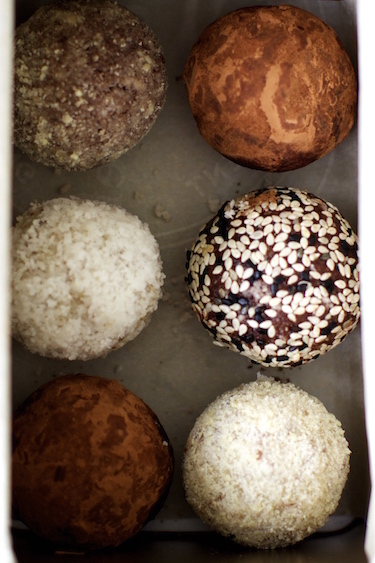 Roll the balls in your choice of coatings like cocoa powder, almond flour, coconut flakes, sesame seeds or chopped nuts. Refrigerate for half an hour before serving. Wow, what a delicious way to be healthy! Perfect desserts for festivals. Can’t wait to try this recipe. Love your pictures. These look so beautiful and perfect for people who don’t overindulge during the holidays Lovely photos, too.